A fox decided to help himself to an easy meal after he found a fisherman’s stash of fish. 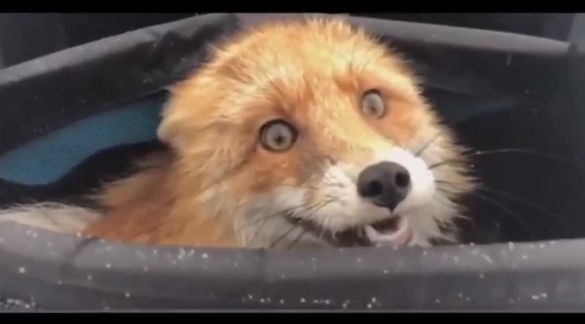 According to the YouTube uploader, the fox was found stealing the Russian fisherman’s catch from the bag at the back of a snowmobile. From the fox’s expression he is either startled that he was discovered or he’s very friendly and familiar around people. Some might say he almost looks proud of having gotten such a good dinner! The red fox eats a wide variety of foods. It is an omnivore and its diet includes fruits, berries and grasses. It also eats birds and small mammals like squirrels, rabbits and mice. A large part of the red fox's diet is made up invertebrates like crickets, caterpillars, grasshoppers, beetles and crayfish. The red fox will continue to hunt even when it is full. It stores extra food under leaves, snow or dirt. The red fox is mostly nocturnal, although it will sometimes venture out in the day. The red fox, unlike other mammals, hears low-frequency sounds very well. It can hear small animals digging underground and will frequently dig in the dirt or snow to catch prey. The fox stalks its prey, much like a cat. It gets as close as it can and then pounces and chases its prey. Responses to "Meanwhile In Russia: Fox Discovered In Fisherman’s Bag After Eating All The Fish"
I hope the sweet thief got through the anger of fisherman and is alive and free.